23-04-19: Get the Best Exclusive Price & Discounts from our Developer Sales Staff, only by prior appointment here. 23-04-19: Our Price Chart & Balance Unit Chart is now updated and available here. 14-05-18: Use our Mortgage Calculator to calculate the Downpayment and Monthly Loan Instalment. Garden Residences is a luxurious private property development, located at Serangoon North View. Jointly developed by Keppel Land & Wingtai Asia, The Garden Residence Development offers 613 specially curated residential units in five 15-storey towers. With a large land area of 17,189.1sqm, there is ample space for a full range of condominium facilities and communal living. The development is nestled within lush gardens, surrounded by a private landed house enclave within the established neighbourhood of Serangoon Gardens and the residential developments of Serangoon North. With its rich history, Serangoon Gardens is one of the oldest estates in Singapore. With a wide range of F&B choices including cafes, restaurants, the famous Chomp Chomp food centre and Serangoon Garden Market, along with shops and supermarkets within the nearby myVillage Shopping Mall, residents in the area benefit greatly from the convenience and access to these daily necessities. Established transport infrastructure provides connectivity to all parts of Singapore. 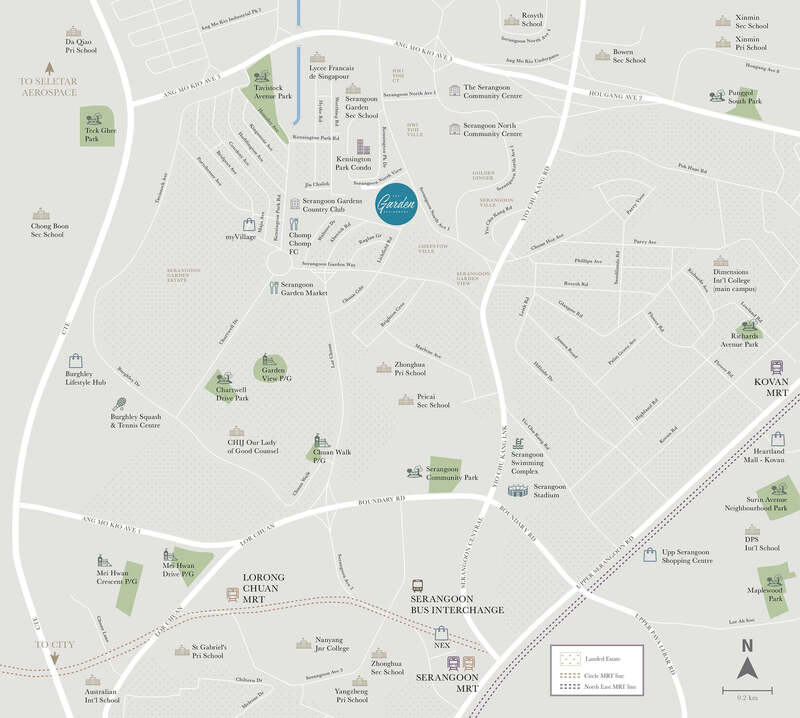 Major expressways like CTE and PIE are minutes’ drive away from The Garden Residence Serangoon. Serangoon MRT and Bus interchange are also nearby and residents are connected via a free shuttle bus service that is available for the first year. Within one kilometre are notable educational institutions such as Rosyth Primary School and Lycée Francais De Singapour. In the vicinity are also NEX shopping mall, Serangoon Community Club, Serangoon Stadium, Serangoon Gardens Country Club and Tavistock Park. The Garden Residences Serangoon, overlooking one of Singapore’s best known and much-loved neighbourhoods, Serangoon Gardens, presents a life that has been built on these fundamentals. Location, one that surrounds you with lifestyle, shopping and F&B establishments. Connections, with a transport network that takes you anywhere you need to be in minutes. Education, because the pursuit of learning at any age should never be undervalued. Architecture, in creating a home that stands the test of time and draws inspiration from the gardens outside, to create a life that’s well-lived inside. A home is more than just a roof over your head, it holds a lifetime of memories. Where growth and wellness are integrated to create an energised, holistic environment for you and your loved ones. There is no better investment than in your family or yourself, and no better place to put down your roots. Our Garden Residences Showflat is available for viewing by appointment (10am – 7pm). Do contact us to make a showflat appointment at The Garden Residence Serangoon North. The Garden Residence Project at Serangoon North View boasts of an excellent location. It is comfortably close to famous eateries such as Chomp Chomp Eating Place, Serangoon Market and MyVillage, for a myriad choice of great food. Major Expressways and Arterial Roads are also within easy reach for accessibility to the whole island. With the development situated at prime location at Singapore, everywhere – work & play – are just nearby. There are also choice schools around Garden Residence Singapore, from primary schools all the way to tertiary education. Families can expect to enjoy decades of immersive and high quality living at The Garden Residence Serangoon North. 1. Jointly Developed by 2 most reputable developers – Keppel Land & Wingtai Asia. 2. Located next to mature Serangoon Gardens Estate with well-established amenities. 3. Within 1 km to educational institutions like Rosyth School, Lycée Francais De Singapour. 5. Well-connected to expressways – PIE and CTE. 6. Near to Chomp Chomp Food Center, Serangoon Garden Market, myVillage and many more F&B establishments. 7. Gardens and Water Features are integrated seamlessly within the development. 8. Enjoy unblocked views of the Serangoon Gardens Landed Estate. 9. All units are in the ideal North-South orientation for good ventilation and lighting. 10. Full 55 facilities, including 75m Swimming Lap Pool, Tennis Court, 24-hour Gym, and Gourmet Kitchen. 11. More than 100 species of plants carefully selected, to purify the air. 12. Well-designed spaces with practical layouts, with master bedrooms that accommodate King-Size bed. 13. Units comes with flexi-storage, with adjustable shelves to fit your storage items. 14. Full height 2.8m wardrobe to maximize usuable space. 15. Well-equipped kitchen with efficient use of space with magic corners to maximise use of dead corners. 16. Enjoy the convenience of living in a Smart Home and Smart Community with a myriad of Intelligent Features. 17. Free Residents’ Shuttle Bus to Serangoon MRT for first year.